Project 6, Making new shutter curtain cloth for large roller blind shutters. For some years we have been putting new shutter curtains into various cameras. For the Leicas, Exactas etc, the best solution is to buy the shutter cloth commercially, it's not cheap, but it's of an appropriately refined quality for instruments of that calibre. Although these days it tends to be on a nylon base. 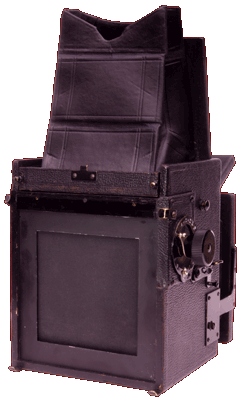 Now wind back to the 1920s or more to the wooden SLRs that were produced by the likes of Houghtons, Kershaw, Graflex or this Thornton Pickard and the cloth they created in house was almost a cottage industry. Fine linen was manually coated, producing characteristic uneven curtains of varying thickness, both between manufacturers and individual cameras. This cloth was slightly thicker than the typical 0.2mm of modern cloth. Since we were clearly going to have to make new shutter curtains for this Ruby we measured the curtain thickness and determ ined an average of 0.23mm. This meant we would need to manufacture our own shutter curtain material as nothing in that gauge could be found commercially. We rejected online solutions we found, like coating a piece of material with acrylic paint, this we felt would result in too stiff a result. So we've developed our own method to create short batches of shutter cloth as needed. The trick is that the cloth should end up pliable, easily rolling around a narrow diameter roller and should not develop a "memory". The opaque coating should sit on top of the cloth, not soak in between the fibres or penetrate between the warp and weft, as this will make the cloth stiff. See the illustrations below. And of course, the shutter curtain should be absolutely opaque with no "pin holes". The chemistry of the original 1920s coating we've not been able to find, from experience it seems that some used water soluble and others not - so clearly there's more than one way. We elected to use an easily available rubber solution. Poor coating - shown in red for clarity, penetrates too deep into fibres and into the warp and weft, making the cloth stiff. Due to, too wet a coating and brushing on - pushing the coating into the cloth. Good coating, sits on top of the fibres, only penetrating enough to remain attached, resulting in a floppy pliable material that rolls easily. Before dismantling the shutter, it's a good idea to photograph the thing assembled. Turn it over and over and learn the relationships between the components. As you take it apart, photograph as you go. Make notes about the start and stop positions of the curtains, how many turns were wound on the springs etc. Take more photos, make more notes. And then some more. Here is the reason this Thornton Pickard Junior Special Ruby Reflex needed new curtains. This is about as wrecked as they get. Not only had the coating broken down to a crisp, the base cloth material just fell apart with light tension. But, they were still good as patterns, gave up all the secrets of the method of attaching to each roller, the tape attachment and there was a clear witness mark showing the overlap between first and second curtains when capped. The original leading edge stiffeners were cut out and re used, as were all the roller components, but the tapes were beyond use. The thickness of the curtain varied between 0.22-0.24mm at different positions. The entire 2nd curtain was sufficiently intact to give up all the details. 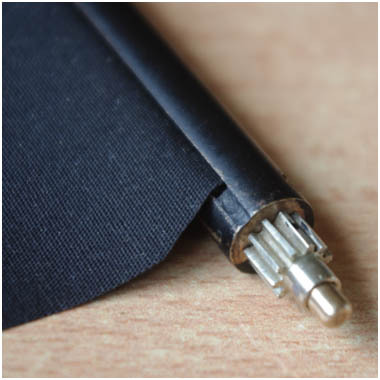 The method of attachment to the top roller, it actually is formed into a stitched pocket that slides over a central spindle within a tube made of rolled brass, the ends are chamfered to make space for the roller end inserts, the curtain emerges from inside the roller tube. The tapes are attached by stitching through itself, the curtain and a doubler, as these are outside of the image area the small holes made by stitching will be blanked off by the focal plane mask. But the pocket containing the leading edge stiffener is glued, as this area needs to be light tight. At the take up end, the tapes are simply glued onto the bottom internally sprung roller with lacquer, one and a half rotations indicated by the glue marks, although it was coming apart. The tapes, of identical thickness to the curtains are proper tapes with a continuous weft tightly driven into the warp, but are not light sealed. 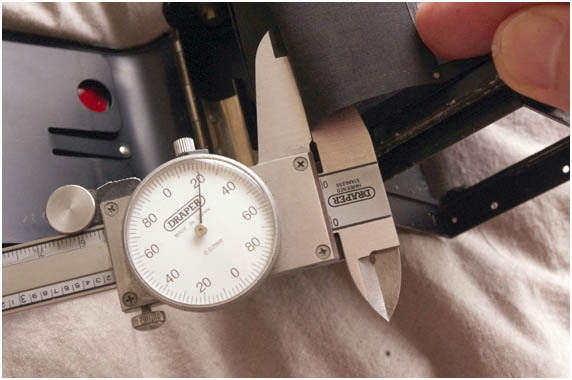 The method of attachment is important, as it bulks up on the rollers and has an impact on the diameter as the curtains are rolled on and off, it must be consistent both sides and between curtains, otherwise the slit formed by 1st and 2nd curtains will not stay parallel or constant during travel. Pocket anchor on original. How it should emerge from the 2nd Curtain top roller, this is actually a post restored image, showing the unsealed side. How the tapes are attached to the curtains, this is the side with the doubler. This results in quite a thick area, giving a bump of 1.8mm. Out of pure academic interest, the table below shows the difference between two theoretical curtains, both on 6mm diameter rollers, Curtain A in the modern 0.20mm material and Curtain B in the archaic 0.23mm material. It doesn't make allowance for the additional complication of the 1.8mm bump resulting from winding in the leading edge of, say. the second curtain. Given that the mechanical gears of the setting mechanism are fixed and will only rotate a set number of rotations, you can see that the thickness of the curtain material will effect the start and finishing positions, so the material needs to be as close to the original as possible. So, making the new shutter material. The first thing is to source some very fine cotton material. In the name of trying to maintain some degree of originality, we chose cotton over a modern nylon material. It needs to be, black, with a tightly woven warp and weft. The longitudinal strands are called the warp, the crosswise, the weft - these alternately cross over then under the warp. The shutter direction of travel should align with the warp, that is the direction the material was created in the loom. The material is slightly stronger in this direction as it needs to be held under some tension during the weaving process, and is less stretchy in this direction. When sourcing the material, take a sample of the original shutter curtain with you and a micrometer, you are aiming to match both the gauge and tightness of the weave. You can't really do this online, you do really need to do this at a shop. 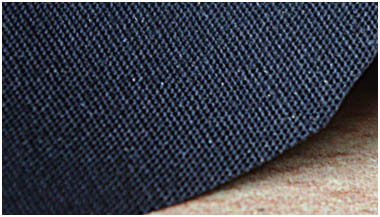 we were able to find a fine cotton material of 0.21mm thickness with beautifully tight weave in the UK. 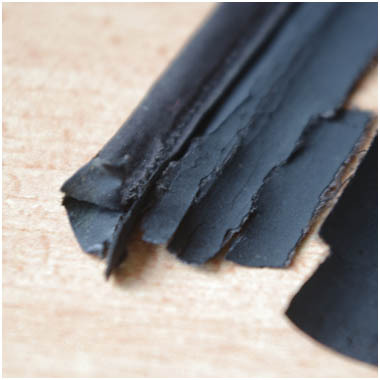 This was perfect as we had already determined that we could create a 0.02mm opaque rubber layer on a test piece. Next up is the rubber coating. This is available in aerosol form, easy to apply. We used Plasti Dip 11203, there may be others - but this worked for us. Cut the board down to a size that will leave a comfortable margin around the size of material you want to create. It's easier to produce in strips and allow for twice the width of the shutter curtain and 50mm either end at least. It's really annoying if you make it a tiny bit too short, better to waste a bit of rubber solution at this stage. Make sure you have allowed for the material that rolls onto the rollers and is glued in place. Plus a bit for error. In the case of this particular camera, we also used the same material for the shutter tapes, so if you go down that route, make allowance for that too. Cut a piece of the sticky back plastic to a size sufficient to wrap your board, right onto the back. Peel off the plastic, and hang it up safely to one side, it will be useful later - but for now, we want the backing paper. 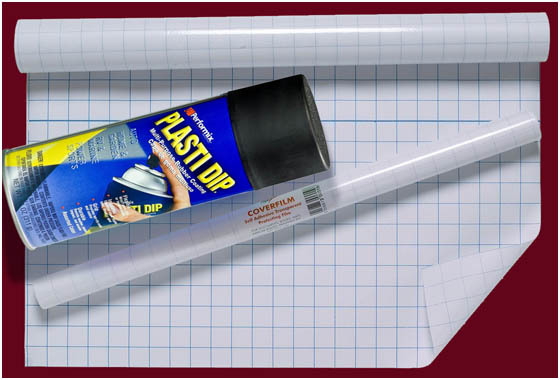 Wrap the board in the backing paper with the non stick side outwards, on the reverse on the board you can tape it down. You can try various strategies, big wide tape over the edge onto the board will just about work, but obviously this stuff is designed not to stick! Drawing pins, or if you have some, double sided tape onto the paper side to the board, whatever works best for you. We used double sided tape, but really, the end result is just to get it to stay put with a flat smooth face on one side. Now the fun bit. Somewhere free of dust but well ventilated, with lots of old newspaper around the area, take your aerosol can of rubber spray and give it a good old shake. Then spray an even layer onto the wrapped board's smooth side. The Paint will tend to collect in blobs a bit, don't worry, keep going but try to get an even wet coating onto the board. Retire to a safe distance, this stuff has masses of solvent to evaporate off, and it's really heady stuff. Make a cup of coffee or tea if you're English. By the time you've drunk that, the first layer should be looking a bit drier. Let it dry to the point it won't leave a fingerprint. Then blow over another equally wet layer and retire once again. To make the time go by, cut out a piece of cloth the size you need, with all the caveats previously mentioned. Make sure you have got the warp in the shutter travel direction. If unsure, the material is generally wound onto the rolls lengthwise off the loom. So when you buy it, make a note as it comes off the roll. Don't worry if it frays a little at the edges, but trim off any loose threads, as they could wander and get trapped in the rubber layer later, which we definitely do not want. 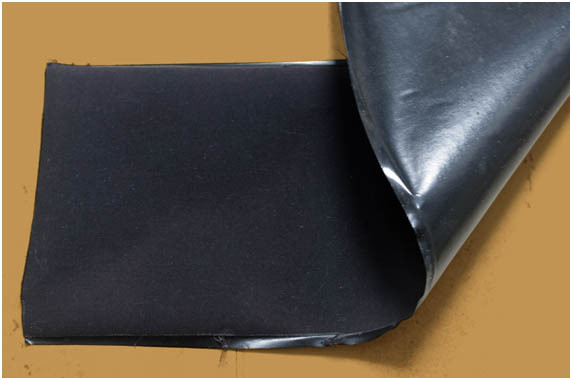 Take your pre cut piece of cloth, and lay it onto the previously saved piece of sticky backed plastic, on the glued side, we are using it to remove any lint and dust that have been attracted to it. Removing it may cause a few frays, if so trim them away. Check on the the board, the rubber solution should be sticky, not soaking. Take your freshly de-dusted cloth, and holding both ends so that it forms an inverted arc, hold it centred over your board, then gently lower it onto the sticky layer, middle first - outwards towards the ends, then just allow the ends to fall onto the layer. If you get it just right, the moist layer will attract the material into itself, the solvent will be drawn into the fibres, making it look damp from your side. Do not move the cloth at all, you get one hit at this. Moving it on the wet layer will encourage the rubber to go too deep into the warp and weft, we need it to sit as close to the surface as possible. Retire. 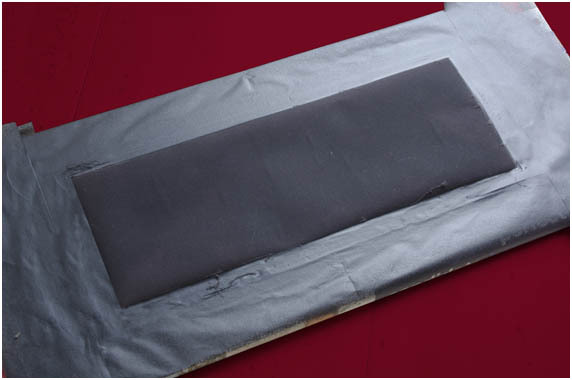 After 20 minutes you can place another piece of sticky back plastic over the drying cloth and place another piece of board on it, just to make sure this layer grips well by pressing it. Leave this for a day. Then remove the board acting as a press. Now leave until all the solvent has evaporated off. If you are patient, leave it another four days. If you remove it too early the rubber relaxes and the cloth will curl. It will probably curl a bit anyway, but you can minimise it by being patient at this stage. This unsightly, unpromising scene is something akin to the result you should expect. Warts and all. A few stray frays, but all out of harms way, maybe a couple of areas where it appears there's a ridge, but it doesn't matter. take a sharp knife and cutting outside of the cloth, break through the rubber layers you created, all the way round, then pick an edge up and peel the cloth off the non stick paper. It's a joyous moment, akin to removing a film from a developing tank.. the moment of birth. 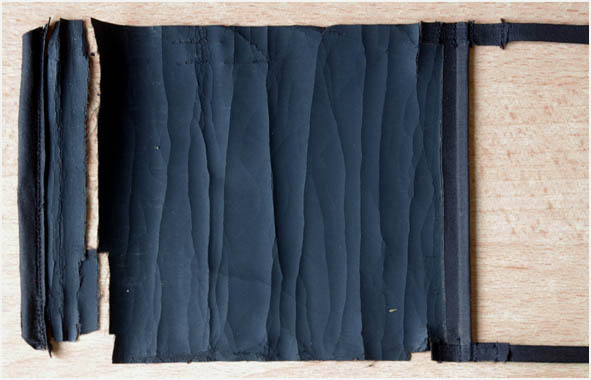 This is the result, a soft, smooth, opaque and floppy rubber coating applied to one side of a fine cotton. The uncoated side typically faces the film and looks just like the original. The purists will note that the coated side is a bit shinier than is ideal, but this is outweighed by the softly pliable nature of this coating that will perform very closely to the original. If you have a handful of pin holes, take a spot of the rubber solution and dab it on the spot. But if you practice a bit, you ought to be able to get a pin hole free piece of material straight off the board. Measure the thickness, to make sure you have it right. Each layer adds about 0.01mm. You can now slice the material to the sizes you need. 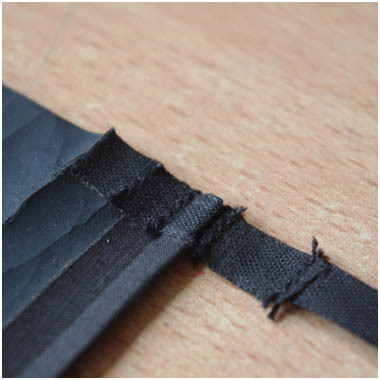 Fraying is longer a problem as the rubber is bound to the material and prevents fraying. The rubber layer is fairly tough and resists handling well. Longevity is an unknown, but shows no sign of stiffening up after a year now, and in fact several test plates were exposed in October 2018, one year after installation suggesting that all is in order with the shutter curtains. Those images can be seen in the camera's gallery. Now, we aren't going into details about making the blinds, we rather assume that if you're the type prepared to take a shutter to pieces and make new cloth, then you are practically minded and already have a good idea what you are up to. Next up for the old Thornton Pickard was to thoroughly clean the shutter mechanism itself. It's a rather disappointing object, badly made, not at all well thought out and full of mechanical drag. It's a sad indictment of English manufacturing. Lack of development, shoddy execution and poor finish. It's hardly surprising Thornton Pickard didn't survive beyond the 1930s. Even at this scale you can witness the crude drilling, nasty unfinished burrs, and roughly hand filed components. But this is what we have to work with. 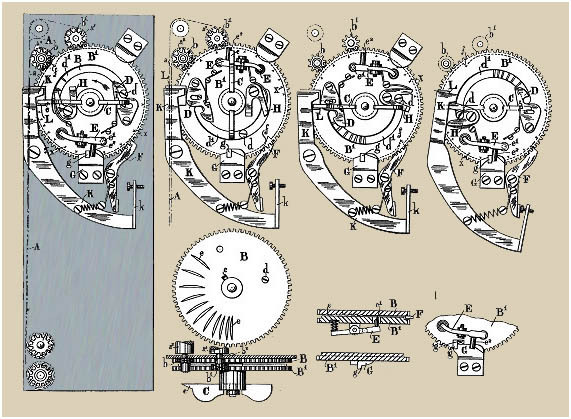 This particular camera was unmarked externally, but the patent number stamped into the top wheel of the mechanism matches that of the Patent application diagram submitted by Thornton Pickard, below - confirming it to be Thornton Pickard product. They were known to supply unmarked cameras to catalogue companies, Boots etc. to sell under their own brands. It would be interesting to dismantle a contemporary Thornton Pickard marked Junior Ruby, to see if they cut corners on the unbranded versions only. 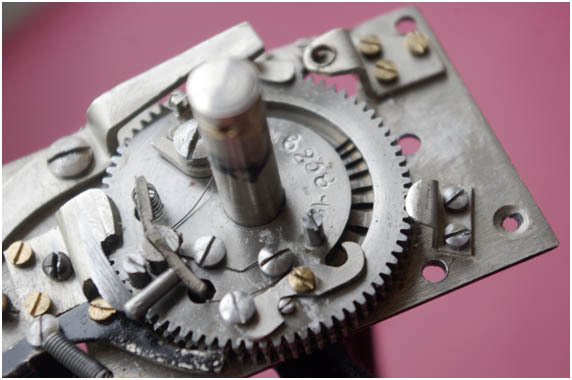 This is a sample of the original patent submitted by Thornton Pickard, and shows an earlier version of the mechanism than the one fitted to the 1924 Junior Ruby above, although the principle features of the patent remain. The lever D has been changed, actually to it's detriment, as it now fouls the wheel retainer, which consequently needs to be backed off so it only just touches the wheel, rubbing it on the toothed area. You can see in the photograph above. The other noticeable change has been to the wheel lock release that allows the shutter to self cap, G on the original diagram. Originally held in place by two screws and the horizontal bar attached to unlock lever E, served both to lift the lock and perform the first curtain stop. In the 1924 version above, unlock ramp G is now held down with three screws and the stop is performed by a separate vertical post screw, as it takes a good whack in order to stop the first curtain at the prescribed position. So there was some development, even if it wasn't all good. The newly manufactured shutter cloth was cut down to make the new curtains. 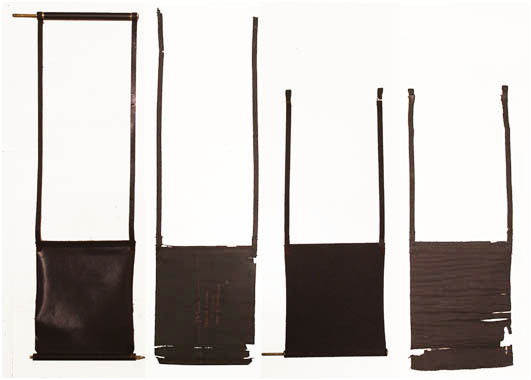 We tried to source new tapes, but weren't able to get the correct gauge, so elected to cut strips of the same cloth we had made for the curtains. Ordinarily, the tapes would made on a special loom making quarter inch wide tapes with an uninterrupted weft to stop the edges fraying on something so narrow. In the absence of anything suitable the shutter cloth proves adequate as the rubber coating serves to stop the fraying, and for the limited use this camera will get, it will probably suffice. Here you can see the newly made shutter curtains alongside the originals, after the rollers and leading edges had been transferred to the new ones. 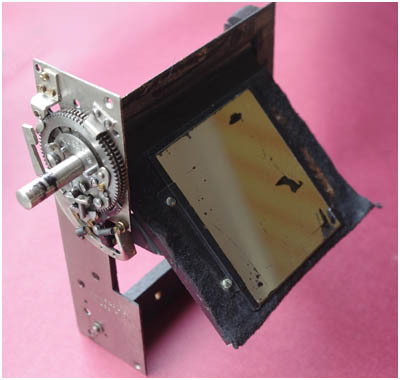 The entire shutter mechanism is withdrawn from the back of the camera in one piece. It will work out of the camera which is handy for setting up. Here the cleaned and serviced mechanism complete with mirror is ready to receive the new curtains. The mirror is a little battered, but the missing areas haven't really impacted on the brightness of the image on the reflex screen, so were left as they were found. The mechanism benefits from a bit of lubricant, and watch out for rust under the bottom wheel, there's little clearance and rust very effectively seizes it all up. The fully rebuilt shutter about to go back into the camera. There were a few adjustments to make and tweaks to the start and stop positions, but we got it all working in the end. 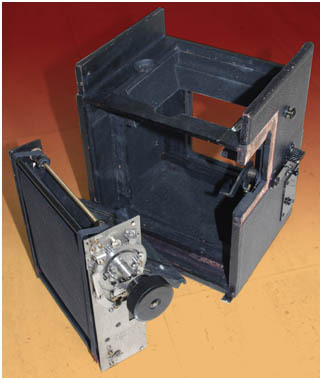 The main point of this restoration was to make the new curtain material, and in fact this camera was sourced for this very purpose, in this respect it seems to have been a success.